The economics of coir fibre production are based upon a multi-linked chain in which much of production is dependent on cheap and abundantly available manual labour. Because of socio-economic conditions prevailing at the village level, mechanising the fibre extraction plant may not the most obvious way forward. Mechanisation practices have to be introduced with sensitivity, that people are not put out-ofwork without providing any real alternatives for income earning in the community. The situation is further complicated because there are few alternatives to manual work within local communities. Livelihoods have to remain sustainable for social well being. There are neither simple nor appropriate technologies developed and applicable, nor those that can be easily adapted from other fibre industries. 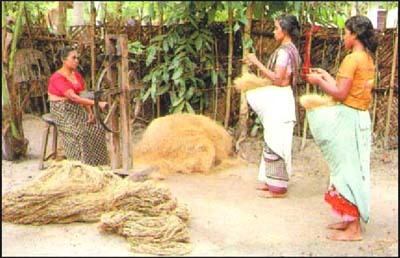 Spinning, weaving and matting of coir employs large numbers of people in the south of India and Sri Lanka. At village level, home workers supply co-operatives and private enterprises with raw materials (such as yarns and mats) of varying quality for further treatment or trade (Figure 10). Increasing productivity is only of interest when market demand expands. Investment in expensive equipment is not economically or practically viable as long as labour costs are low. However, traditional practices cannot remain entrenched in a constantly changing industrial sector. As markets become more open, competition may be expected from other coconut producing areas where traditional industries and trade unions are not, for example, bound to maintain employment levels. Investment in added value, for example, for materials currently considered waste, presents attractive options to the entrepreneur. In areas where labour costs are higher, such as the Philippines, mechanized spinning has been successfully introduced. Eventually, more opportunities for employment, better wages, improved conditions of working and a better quality of life for coir industry workers may be achieved by increased use of mechanisation, and the higher productivity that this brings. According to prices quoted on the Alleppey market34 in India, coir husks cost within the range Rs 500 for 1000 husks which, after retting, may yield 90 kg fibres at a price of Rs 8-10/kg (or US$0.20-0.25/kg). Green decorticated fibre may cost up to Rs 7.50/kg. There is little fibre wastage in spinning, so around 98 kg of yarn is produced from 100kg of fibre. High quality Anjengo yarns may yield around Rs 25/kg, while Vycome is quoted at Rs 17.50/kg. Traditional hand spinning of fibre to yarn using a spinning wheel requires three people, who may produce 12-15 kg of yarn per day. Export prices for finished coir products such as handloom mats and matting, rugs and carpets range between Rs 70-80/kg. Prices and costs of production should be considered in context; in the context of international fibres industries developments in recent years and, importantly, within the context of the out-moded and ancient industrial production methods that characterise coir fibre and yarn production in the partner countries. Notwithstanding a reasonably buoyant market for these products in recent times, neither India nor Sri Lanka have modernised their domestic industries. Local producer industries in Kerala State in India, for example, support over 300 000 direct workers (and families) working for more than 750 cooperatives. More than 30 per cent work with handlooms (of which there are an estimated 50 000). The handloom industry has come under increasing economic and technical pressure as the result of inefficiencies within the system, competition from powerloom cloth, lack of quality and shrinking markets. Public sector support is being introduced to enhance investment from the commercial sector with changes to mechanized coir extraction, and motorised spinning of yarn, in an effort to accommodate the social changes required. Considering the labour-intensive nature of current production, however, wages remain low (below Rs 10/h). This is currently considered a reasonable income (of the order US$2/day) by the unions that support the workers and the public services within which industrial labour managed. There are, however, cycles of poverty herein that prevent the industrial workers (and their service communities) from raising their standards of living when earnings are this low. To achieve greater wealth in the community, productivity has to be raised within the industry upon which the community is dependent. Alternatively, additional economic activities have to be introduced to augment or replace the main source of income. Both approaches are underway within the coir producing communities in which the CFC/FAO project was implemented. Hydrogen peroxide recipes developed by the project team for bleaching coir fibres and coir products have been successfully introduced to domestic industry, with substantial saving of costs (of the order 50 per cent) and with considerable benefits for the environment. Further cost reductions are recommended, including recipes for a pre-treatment step with the use of bleaching powder (five per cent Cl2). If introduced, however, this would have some ecological disadvantages. Costs for chemicals needed with the use of recommended chlorine-free bleaching recipes (Appendix A) have been calculated. For the hot process (recipe A) these are Rs 587 per 100 kg coir yarn, and for the cold process (recipe B) Rs 758 or, respectively, Rs 817 and Rs 1,107 for fibre. These cost were slightly higher when compared to the recipes in use with domestic industry using combined cold (peroxide and chlorine) bleaching processes. The costs of dyeing coir using conventional and mechanized methods have been compared for standard recipes (Table 4). On average the costs of dyeing are increased by the use of mechanized methods, but uniformity and consistency of shade was improved. The additional costs per kg of dyed coir fibre is estimated at Rs 1-2 for acidic dyes, Rs 2-3 for the most commonly used basic dyes and Rs 3-4 for direct dyes. The total current market for dyestuffs for the Indian coir industry is estimated at 50 tonnes per year. The costs of dyes are estimated to range between Rs 6-10/kg. So far, chemical methods developed by the project for softening coir fibres have not been introduced into normal practice by the coir producing industry. Cost effectiveness was not proven. However, semi-bulk scale trials of spraying vegetable oil emulsions (e.g. castor oil at Rs 8/kg) on to the fibres (0.2 per cent w/w) have been successfully tried, with considerable improvements noted for yarn quality. Basic dyes are preferred because they give a more brilliant colour and are cheaper (Rs 0.25-0.75 per mat at 25 per cent surface covering). The reactive dyes give a better fastness, but have not been taken up by industry mainly because of cost (Rs 1-3 per mat at 25 per cent surface covering). Printing with reactive dyestuffs (e.g. procion brilliant red M8B, urea and sodium bicarbonate) will cost Rs 1.05 per mat (0.34 m2) A printed mat of this kind may retail at up to US$20 in Europe or the United States. The costs of drying coir are relatively high and will add substantially to raw material costs. No cost calculations have been provided by the CCRI project team, but the energy required for removing 25 per cent weight water (requiring at least 2.5x106 J/kg) adds approximately US$0.01-0.02/kg fibre without considering investment costs. For raw materials, which normally cost less than US$0.20/kg, this means a 10-20 per cent increase in costs.